On September 8, 1939, one week into the Nazi invasion of Poland, German armoured troops reached the gates of Warsaw. The Polish government and High Command had left the city but a determined garrison awaited the enemy invader and the Poles were able to stave off two consecutive German attempts to take the capital by armoured attack. Thus began a siege that would last for three weeks and subject the Warsaw Army of over 100,000 and the civilian population of over one million to a ruthless campaign of aerial bombardment and heavy artillery shelling, causing thousands of casualties and widespread destruction. It was a hopeless battle that could only end in defeat and on September 27 the Polish garrison capitulated. The photos of the first penetration by tanks and infantry of the 4. 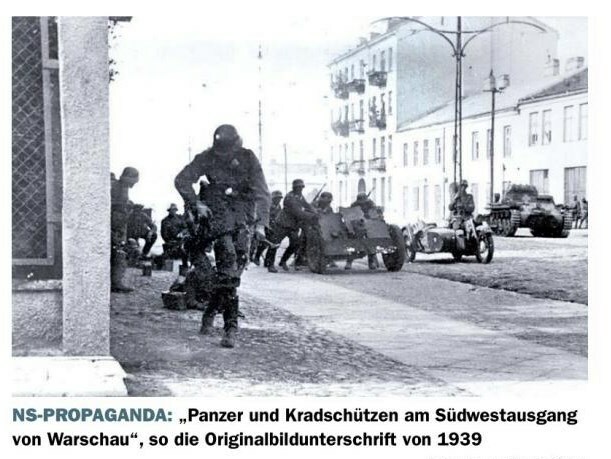 Panzer-Division taken on September 9 became standard repertoire of German propaganda publications on the Blitzkrieg in Poland. On September 8 – eight days after the start of the campaign and after an amazing dash of 80 kilometres in ten hours – lead elements of the 4. Panzer-Division suddenly appeared on the outskirts of Warsaw. Taking advantage of the surprise, the Germans immediately launched an attack into the city, hoping to capture it on the run. The first attack, in the late afternoon of the 8th and by Panzer-Regiment 35 only, was quickly stopped by the fierce Polish resistance in the outer borough of Ochota. The second attempt, by the entire division and on a double axis, on the morning of the 9th penetrated deeper into the city but was again repulsed in heavy fighting in Ochota and Wola. A Propaganda-Kompanie photographer, Bildberichter Otto Lanzinger, accompanied one of the attacking columns into the city and his pictures have become classic images of the 1939 fighting for Warsaw. Here a number of PzKpfw I and IIs roll forward while supporting infantry keep close to the houses. A PzKpfw II advances past another one. These photographs were taken on Grojecka Street, the main thoroughfare entering Warsaw from the south-east and leading into the borough of Ochota, at its intersection with Siewierska Street. Grojecka was the axis of attack of Panzer-Regiment 35 both on the afternoon of the 8th and again during the morning of the 9th. The long shadows in Lanzinger’s photos show the sun in the east, which proves that they were taken on the 9th. Some 150 metres back along Grojecka, near its junction with Przemyska Street, Lanzinger pictured a 7.5cm le. IG 18 light infantry gun set up to engage enemy troops defending behind a barricade. The gun has just fired off a round and smoke is still curling from its barrel. Panzer I and IIs are waiting behind. Black smoke rises up from a disabled vehicle in the background. Back up front, and right in front of where Lanzinger is taking cover, another gun – this one a 3.7cm Pak 36 – has been set up. Across the street is its Krupp Kfz 69 towing vehicle. Two Panzer Is roll forward. The 4. Panzer-Division had begun the campaign with 341 tanks: 183 Panzer I, 130 Panzer II, 12 Panzer IV and 16 Panzerbefehlswagen. However, by the time it reached Warsaw, both tank regiments had suffered losses and all four tank battalions were below strength. Map of initial ground attacks on Warsaw. Poles-blue, Germans-red. Warsaw in 1939 was a city of 1.3 million inhabitants. From the very first hours of the campaign, this huge metropolitan area became the target of an unrestricted aerial bombardment campaign by Luftwaffe bombers and dive-bombers, mainly from Kesselring’s Luftflotte 1 supporting Heeresgruppe Nord. On September 1, a force of some 90 Heinkel He 111 bombers from Kampfgeschwader 27, protected by 36 Me 109 fighters from Jagdgeschwader 21, together with 35 He 111s from II./Lehrgeschwader 1 raided the capital. They hit military targets, such as infantry barracks, the aerodrome and the PZL aircraft factory at Okecie in the south-west and the Warsaw radio station in Fort Mokotow in the south. However, right from the start, they also freely bombed civilian facilities such as waterworks, hospitals, market places and schools, and strafed civilians with machinegun fire. The attacks came as a complete surprise. The streets were crowded and dozens died in the first few minutes. Later that week, in order to disrupt communications, the bombers and dive-bombers attacked the city’s railway stations and the Vistula bridges – the latter without success. On September 3 alone 1,500 civilians were killed. A girls’ school was hit on the 4th. Warsaw’s air defence depended mostly on the fighters of the Polish Air Force’s Pursuit Brigade (Brygada Poscigowa) under Colonel Stefan Pawlikowski. It comprised two squadrons and was equipped with 54 fighter aircraft, chiefly the PZL P. 7 and PZL P. 11 types. The city’s anti-aircraft artillery under Colonel Kazimierz Baran had 86 AA guns and various detachments of anti-aircraft machine guns. Initially the air defence of the capital was fairly successful. During the first six days, the Pursuit Brigade managed to shoot down 43 enemy aircraft, while the anti-aircraft artillery destroyed a similar number. In addition, there were nine unconfirmed victories and 20 damaged aircraft. However, the brigade had itself also lost 38 machines, or approximately 70 per cent of its strength. The city’s air defence began to crumble on September 5 when the military authorities ordered 11 of the AA batteries withdrawn from Warsaw towards Lublin, Brest-Litovsk and Lwow. The following day, September 6, the remnants of the Pursuit Brigade were also transferred from the Warsaw sector to Lublin. With rumours of the rout of the Polish armies reaching the capital, thousands of inhabitants packed their belongings and fled to the east, only to meet up with other refugees heading westwards. At the same time, masses of people entered the city from the west, fleeing before the German invading forces. Stukas swooped down on the long columns of people, strafing and striking terror at leisure. On September 4, Polish President Ignacy Moscicki and his government evacuated from Warsaw, transferring their seat to Lublin, 150 kilometres to the south-east. Commander-in-Chief Marshal Smigly-Rydz and the Polish General Staff also left the capital, on the night of September 6/7, moving to Brest-Litovsk, also 150 kilometres to the rear. Their departure led to further panic and chaos in the capital. At one time, it had been the Government’s intention to declare Warsaw an `open city’, but this idea was now abandoned. The capital would be defended at all cost. On September 3, before he left, Smigly-Rydz ordered the creation of an improvised Warsaw Defence Command (Dowodztwo Obrony Warszawy). General Walerian Czuma, the head of the Border Guard (Straz Graniczna), was appointed its commander and Colonel Tadeusz Tomaszewski its Chief-of-Staff. Initially the forces under command of General Czuma were very limited. Most of the city authorities had withdrawn together with a large part of the police forces, firefighters and military garrison. 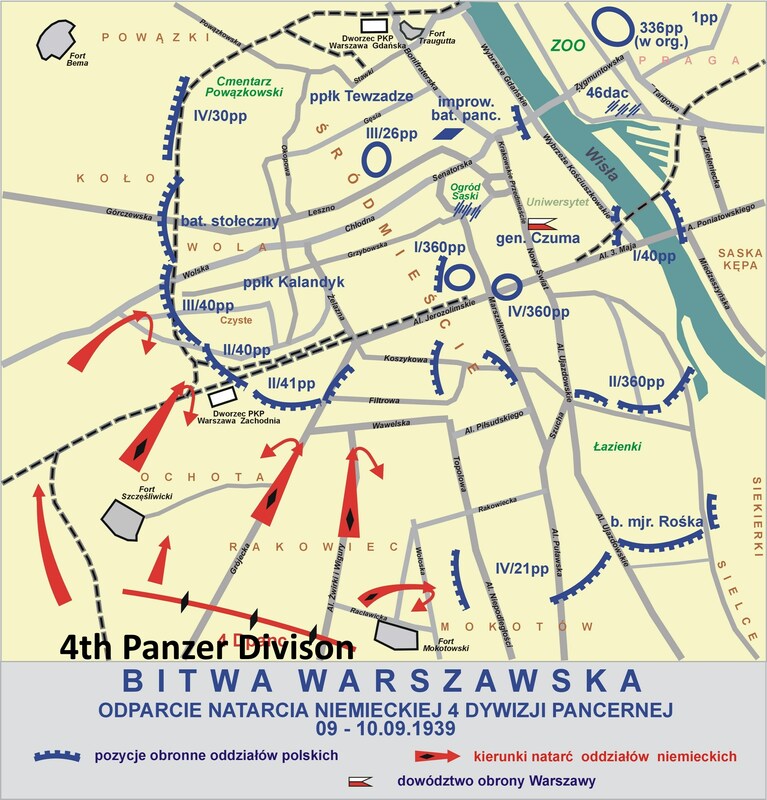 Warsaw was left with only four battalions of infantry and one battery of artillery. Also, the spokesman of the Warsaw garrison had issued a communiqué in which he ordered all young men to leave the city. To co-ordinate civilian efforts and counter the panic that threatened to engulf the capital, Czuma appointed the President (Lord Mayor) of Warsaw, Stefan Starzynski, as the Civilian Commissar of the capital. Starzynski immediately started to organise the Civil Guard to replace the evacuated police forces and the fire-fighters. He also ordered all members of the city’s administration to return to their posts. In his daily radio broadcasts he asked all civilians to construct barricades and anti-tank barriers at the city outskirts. Defensive field fortifications were constructed mostly to the west of the city limits. Streets were blocked with barricades and overturned tram cars. Cellars of houses were turned into pillboxes. Gradually, the forces of General Czuma were reinforced with volunteers, as well as rearguard troops and various army units, primarily from the Lodz and Prusy Armies, retreating before the onslaught of German armoured units. One was a stray battalion of the 41st Infantry Regiment `Suwalski’ from the destroyed 29th Division. On September 7, the 40th Infantry Regiment `Children of Lwow’, part of the 5th Division and commanded by LieutenantColonel Jozef Kalandyk, was transiting through Warsaw towards previously assigned positions with the Pomorze Army. The unit was stopped and joined the defence of the capital. By the 8th General Czuma had gathered some 17 infantry battalions under his command, supported by 64 pieces of artillery and 33 tanks. The latter – 27 light tanks of the Vickers E, 7-TP and R-35 types and six TK-3 and TKS tankettes – were formed into the 1st and 2nd Light Tank Companies. The last Polish formation defending before Warsaw was the 13th Infantry Division, positioned near Koluszki in central Poland. After bitter fighting with Hoepner’s XVI. Armeekorps on September 6-7, its lines were broken by the 4. Panzer-Division, which captured the town of Tomaszow Mazowiecki, located 115 kilometres southwest of Warsaw, During the night (September 7/8), most of the soldiers of the 13th Division panicked and deserted, enabling the 4. Panzer-Division to carry on to Rawa Mozawiecka, another 35 kilometres closer to the Polish capital. On the morning of September 8, the 4. Panzer-Division – now well ahead of the rest of the 10. Armee – made a lightning dash towards Warsaw, 80 kilometres away. Moving out at first light from Rawa Mozawiecka, with Panzer-Regiment 35 in the lead, it brushed aside pockets of enemy resistance and reached Radziejowice, 35 kilometres on. With Polish soldiers surrendering by the thousands, the panzers rushed forward another 35 kilometres to Wolica, an outer suburb south-west of Warsaw, hoping to secure crossings over the Utrata river at Raszyn. Attacking at 1.15 p. m., the panzers destroyed two Polish light tanks and pushed back the Polish infantry but they could not prevent the Poles from blowing up two bridges right in front of them. Undaunted, the light panzers forded the brook, while attached engineers from Pionier-Bataillon 79, protected by infantry from SchützenRegiment 12, quickly repaired the crossings. Soon the lead troops were approaching Okecie, the airfield right on the south-western edge of the metropolitan area. 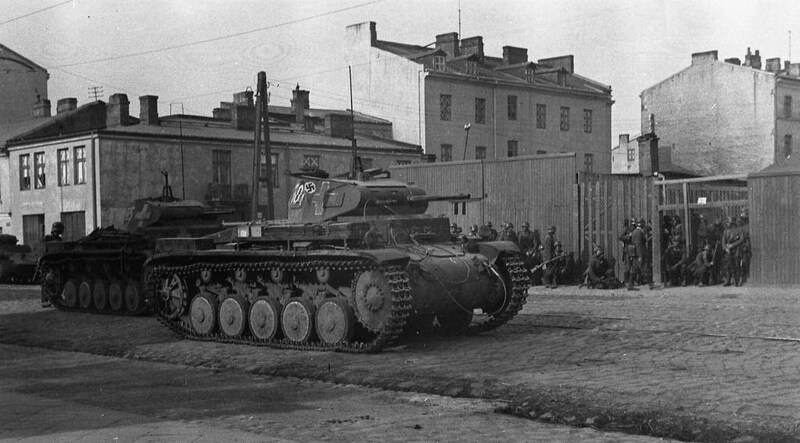 Panzer-Regiment 35 had reached the city limits of Warsaw. Back at the divisional command post at Nadarzyn, ten kilometres to the rear, Generalleutnant Georg-Hans Reinhardt was just receiving a visit from his army and corps commanders, Generals Reichenau and Hoepner. Having heard rumours that the Poles had declared their capital an open city, the three generals did not expect serious resistance and together they worked out exact plans for the seizure of the city. The division was to advance in two columns, with Panzer-Regiment 35 and Schützen-Regiment 12 on the right and Panzer-Regiment 36 and Infanterie-Regiment 33 on the left. However, the latter three units were still moving up and it would take some time for them to reach the start line. Up front, the commander of Panzer-Regiment 35, Oberst Heinrich Eberbach, thought he could take the city on the run. Conferring with Hoepner and Reinhardt, he recommended that the surprise of the enemy be exploited and that he be allowed to continue the advance without waiting for the rest of the division. Permission was granted. 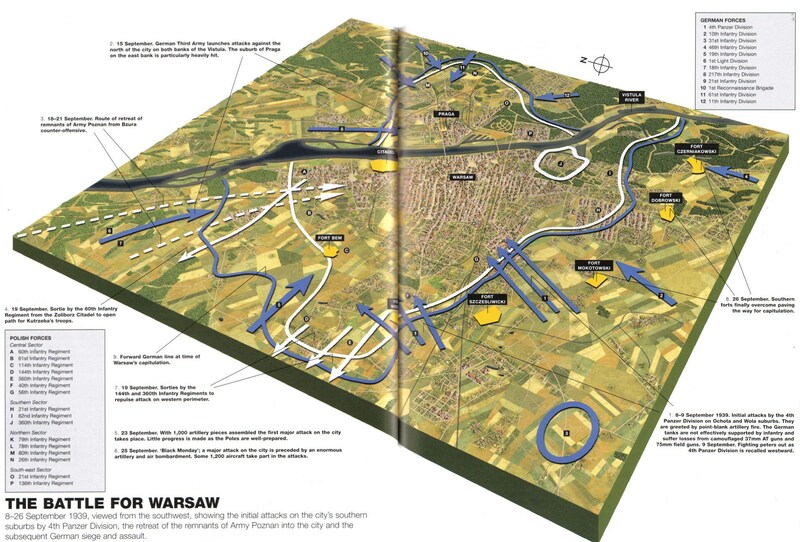 A Storch light aircraft hurriedly flew in a few street maps of Warsaw and a plan of attack was made. Entering from the south-west, the regiment’s II. Abteilung was to advance across Pilsudski Square and then cross the Vistula to the east bank; the I. Abteilung was to remain in the centre of the city. Aerial support for the attack was quickly arranged through Kesselring’s Luftflotte 1 (nominally in support of Heeresgruppe Nord) which sent in 35 Henschel HS 123 biplane divebombers from II./Lehrgeschwader 2. At 5 p. m. Eberbach’s regiment began the assault, advancing towards the borough of Ochota. A few rounds were fired. Just beyond the Rakowiec settlement the houses momentarily stopped, an open area partly filled with suburban vegetable gardens stretching out before the tankers’ eyes. The tanks moved across a road bridge, the actual outskirts of the city being 400 metres beyond. As they entered the built-up area, the road ahead was blocked by a barricade of overturned streetcars and furniture trucks. Suddenly, a rain of fire fell on the force. From four-storied apartment buildings, ventilation openings in the rooftops, windows and basement openings, Polish soldiers of the 40th `Children of Lwow’ and 41st `Suwalski’ Regiments opened up on the tanks with everything they had. One of the few PzKpfw IV (the whole regiment had just eight of these in its 4. and 8. Kompanie) received a direct hit. It was recovered under fire but the attack was stalling. By now the sun was setting. Realising that Warsaw was not an open city and that the Poles were strongly defending it, Eberbach called off the attack and withdrew his tanks behind the bridge. For now, all by itself and well ahead of the rest of the division, the regiment needed to secure itself on all sides. At 7.15 p. m. that evening – a point in time when the panzers were still battling in Ochota – German radio already broadcast the OKW communiqué bringing the headline news that German troops had penetrated into Warsaw. During the night, the remaining elements of the division caught up with Panzer-Regiment 35: the tanks of Panzer-Regiment 36, the infantry of Schützen-Regiment 12 and Infanterie-Regiment 33 and the divisional artillery. Thinking he was now strong enough to take the city, Generalleutnant Reinhardt ordered the attack to be repeated the following morning with all available forces. PanzerRegiment 35, supported by Schützen-Regiment 12, was to repeat its attack along the main road into Ochota. Panzer-Regiment 36, supported by Infanterie-Regiment 33 and two engineer companies, was to launch an attack from positions further to the north, along the main road leading into the borough of Wola. At 7 a. m. on September 9, following a tenminute preparatory artillery barrage on the city’s edge, the 4. Panzer-Division again moved into the assault. Dive-bombing support was once more provided by Luftflotte 1, which had dispatched the HS 123s from II./LG2 and 140 Stukas from StG77 and III./StG51. Leading the attack into Ochota, the I. Abteilung of Panzer-Regiment 35 (Hauptmann Meinrad von Lauchert), with infantry mounted on the tanks, once again rolled across the bridge, followed by more infantry and attached engineers. The first road barricade was eliminated. Despite strong Polish resistance a second bridge was taken and the tanks reached the streets of Warsaw. Once in the built-up area, the German infantry had to take each house and clear it. The Poles resisted fiercely with burst of machine-gun fire, hand-grenades dropped from above and tossed from cellar openings, even with blocks of stones dropped from the roofs. Anti-tank mines buried in the road verges and adjoining fields disabled several panzers. The fiercest fighting in Ochota was at the barricade erected near the junction of Grojecka and Siewierska Streets and defended by the 4th Company of the 40th Regiment. The panzers attempted to continue by themselves. The lead tank, commanded by Leutnant Georg Claass of the 1. Kompanie, was hit by a well-camouflaged anti-tank gun. The first round failed to knock it out but the second set the vehicle on fire. Claass and his radio operator managed to bail out but both later succumbed to their wounds. The same Polish gun immobilised the vehicle of the regimental adjutant, Oberleutnant Heinz-Günther Guderian (the son of the panzer general). Dismounting and escaping through a courtyard gate, Guderian came across the tank of Leutnant Diergardt and a platoon of infantry. Taking both under his command he continued the attack. Advancing through courtyards and gardens, Leutnant Wilhelm Esser and two platoons of tanks from the 2. Kompanie were able to advance as far as the railway line, where Polish defences knocked out his radio. Oberfeldwebel Ziegler in his PzKpfw III assumed command of the remaining vehicles and managed to advance as far as the main railway station. All by himself in the middle of the capital, he eventually had to pull back. Leutnant Gerhard Lange worked his way forward to an enemy artillery position and opened fire on the guns with everything he had. The Poles attacked by throwing shaped charges against his tracks, which tore off one of the roadwheels and blocked his turret, and he too had to pull back. Throughout the battle the Stukas of StG77 and III./StG51 gave support by attacking the Polish main artillery positions which were located in Praga, on the far side of the city and east of the Vistula. In addition to divebombing the gun sites, they swooped down on the city’s main avenues and on the railways in an attempt to obstruct Polish troop movements. Around 9 a. m. Oberst Eberbach committed the II. Abteilung (Major Wilhelm Hochbaum), which had been held in reserve and was supported by another battalion of Schützen-Regiment 12, to the area one kilometre north of the main road, where the Polish defences appeared less well organised. This force initially made good progress, overrunning Fort Szczesliwice, one of the old fortifications surrounding the capital. However, as they reached the park beyond, the mounted riflemen received rifle and machine-gun fire from the high-rises on the left. Just as they deployed to engage it, Polish artillery fell among them and a few vehicles caught fire. Meanwhile, Polish anti-tank guns stopped the advance of the tanks. Oberleutnant Heinz Morgenroth, the commander of the 8. Kompanie, was fatally wounded. Of the two panzer platoons that advanced into the park, only three tanks came back. 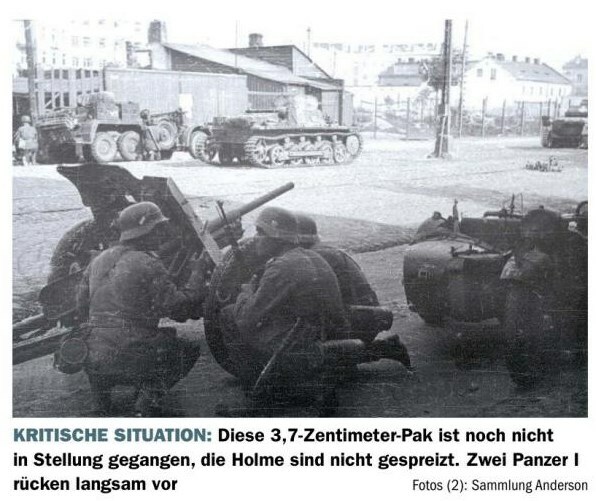 The story was much the same with PanzerRegiment 36, attacking north of the railway line and into Wola. Here too, well-placed Polish 75mm anti-tank guns firing at pointblank range, and the barricades erected on main streets, managed to repel the German assault. The civilian population took an active part in the fighting and the Germans were halted with severe losses. On several occasions the Poles made up for their lack of armament by ingenuity. Colonel Zdzislaw Pacak-Kuzmirski, commander of the 8th Company of the 40th Regiment, found 100 barrels of turpentine in the Dobrolin Factory and ordered his men to position these in front of the barricade at the intersection of Wolska, Elekcyjna and Redutowa Streets. When the German armour approached, the liquid was ignited and several tanks were destroyed without a single shot being fired. The TP-7 tanks of the Warsaw Defence Command were actively engaged in the battles. Those of the 1st Light Tank Company joined in the heavy fights around Okecie airport, but they were no match for the German panzers and suffered considerable losses. Those of the 2nd Company took part in the successful defence of Wola. 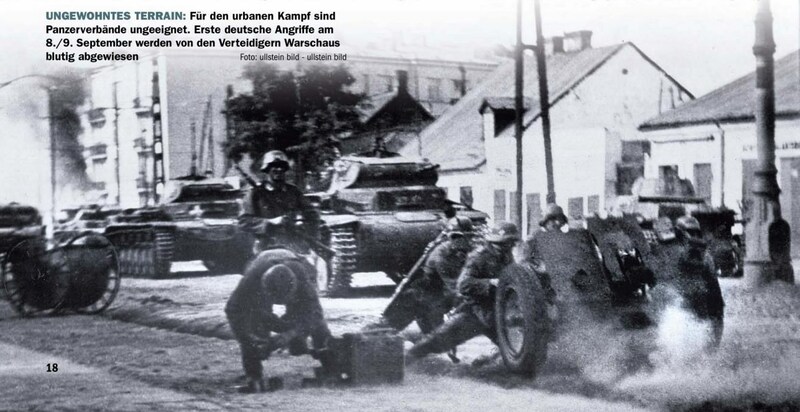 (which controlled the two panzer regiments), was immobilised by anti-tank fire as it made its way back. When the XVI. Armeekorps sent an order to renew the attack immediately, Reinhardt drove back to the corps command post and convinced Hoepner that this was absolutely impossible. All that could be done for now was to lay siege to the capital from the west. During the night, a large number of the disabled panzers, including some that had run over mines, were recovered by their crews, in some cases from out of the Polish lines. Additional reinforcements arrived in the form of Infanterie-Regiment Leibstandarte-SS `Adolf Hitler’ (mot. ), the Führer’s bodyguard unit turned into a motorised infantry unit and commanded by SS-Obergruppenführer Sepp Dietrich.